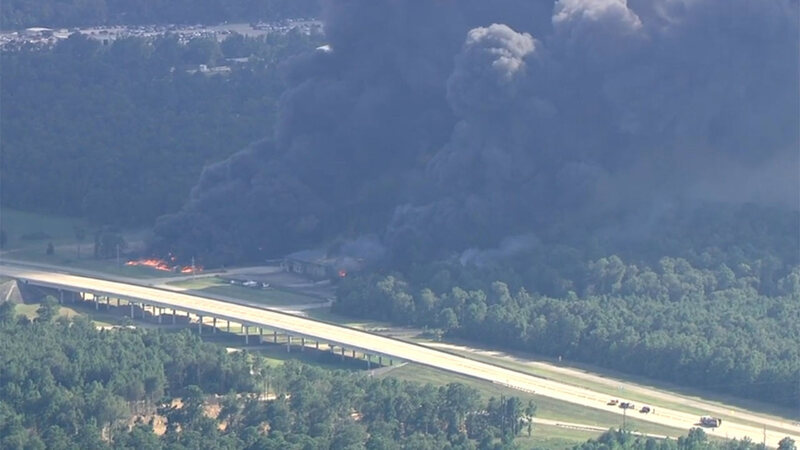 A series of explosions rocked a Conroe oil filed chemical supply company, setting off a fire that sent a broad, dense column of thick, black smoke into the sky. 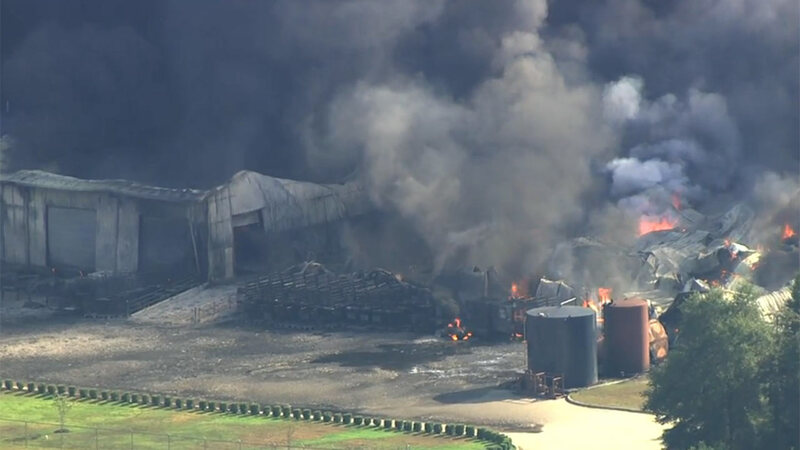 CONROE, TX (KTRK) -- A series of explosions rocked an oil filed chemical supply company in Conroe on Friday, setting off a fire that sent a broad, dense column of thick, black smoke towering into the otherwise blue skies. The CEO of DrillChem Drilling Solutions, Brandon Hayes, said no one was in the plant at the time of the explosions, and all of his employees have been accounted for. "It's really awful when something like this happens. But our primary concern was the people," said Hayes. ""It's a very scary event and like I said we are going to everything we can to get everything cleaned up as soon as possible." Authorities said they knew of no one who was injured in the explosions or blaze that erupted about 4:30pm Friday. Firefighters took about two hours to bring the fire under control. "The facility was empty at the time of the fire and we are thankful that no injuries have been reported," said DrillChem CEO Brandon Hayes in a statement. "We are working closely with local authorities to determine the cause of the fire and assess the extent of the damage." Units from several fire departments and a hazardous-materials team were at the scene. Residents up to 2 miles from the fire site were told to remain indoors. By nightfall, the alert had been reduced to a half-mile radius before being lifted completely about 7:30 p.m.
Air monitors have been set up to check for toxic air pollutants, and the U.S. Environmental Protection Agency has been notified, Conroe Fire Marshal Mike Legoudes said. Floyd Baker said he was on his tractor when he felt two blasts. "It rocked it over like that then back, and I said wow, .I wonder what that was," said Baker. Wayne Patterson, who lives less than a mile from the facility, had just stepped from his back door with his dogs when he "saw a huge cloud of black smoke," he told The (Conroe) Courier newspaper. "The last explosion ... we heard about three or four, but the last one shook the house," he said. Patterson said he received a text message requesting to turn his air conditioning off. His son, who lives about a half-mile away from the explosion, drove to Patterson's house to seek shelter. "Our eyes were burning. It's not too bad, but they are burning," he said. We don't know what's in the plant, of course, but we do know that DrillChem is a major manufacturer of lubricants, sealants and chemicals that help with drilling for oil.